Here’s why those two things aren’t always what someone should be looking for when hiring a freelance writer. Also, some ways to tell if a freelance writer really is a freelance writer or is a representative of an agency which is like a sweat shop for content or is probably not a respectable to talented freelance writer with the proper skill set. Often I will engage potential clients who send me a message like above and talk about content and quality versus price to determine if there’s some middle point we can meet at to get a small freelance writing project on the books. People even don’t understand what you ask them. This is not only about less or more money, it’s about not getting what you want be it for 10$ or 1000$. I simply don’t know who to trust this work. As even people with huge portfolios tend to fail to deliver and lie. So far been trying at least 9 people. The articles were written so so/ok, passed the plagiarism test, you won’t believe this but the subject they wrote on had nothing to do with the subject I’ve ordered!! That’s just one example of what a client told me as we were talking about me taking on a freelance writer project for them. That made me think about how to find out if an alleged freelance writer on one of the gig economy sites, is really a freelance writer. You can apply a lot of this to other areas as well, not just freelance writers. I am an actual freelance writer. In my company, the management, accounting, human resources, and freelance writers are all me. There is no one else. I am a single person, sole proprietorship. Why do you care? Well, for starters, my work is my reputation. If I do shoddy work, I don’t get more work. I don’t get paid, and I don’t eat. Alright, that last part is an exaggeration, I eat, but I eat crap food, or less than usual. I’m never totally without work. When things are lean I’ll take underpaying work to keep the lights on and the rent paid. So, what about those other freelance writers? Well, many are not. What they are, are non-native English speaking companies, or agencies, in other countries like China, India, and elsewhere (I only cite the two most prevalent that I run up against). They are clearing houses for low-quality, fast content production. They produce thousands of articles a day, and quality check almost none of them. That’s the major difference. See, I must quality check everything. Not only to ensure that I have continued business, but because my nigh-perfectionist personality requires that I do so. That is because I cannot stand poor grammar, misspelled words and crappy sentence structure. Passive voice when it should be active, improper verb tenses, multiple tenses in a sentence when it should all be cohesive. All of that bothers me, a lot. That’s not to say that all freelance writers are created equal. I see terrible grammar and spelling all over Fiverr, Upwork, Remote, and numerous other gig economy sites. Mostly, this is due to there being few tests or requirements to become a freelance writer. Upwork does supply a lot of tests but most people don’t take them. I’ve only done one to date since they re-branded away from eLance.com. Here are a few examples of solicitations for freelance writer gigs that make me wonder how they get work at all. …are you trying to get thru college but have a rough time writing a descent paper. In fact, most freelance writers I have checked into on those sites have not even taken a basic English Grammar test. 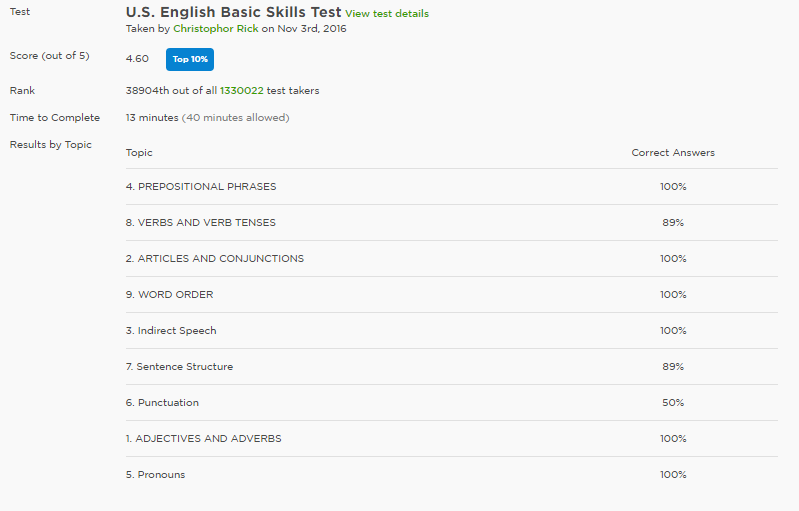 Here’s my basic English test score from Upwork. Yes, I took 13 minutes to blaze through an English basics test. I could have taken up to 40 minutes, I believe, and probably could have done better. But I tried to balance speed and accuracy. I could go spend more time on it and raise the score and I do not believe it would state that I retook the test. Here are the expanded results. Ouch. OK, I SHOULD have taken more time on the punctuation area. Still, 13 minutes, 40-50 questions I think, not so terrible. I wonder if that score is indicative of an Oxford comma versus a no Oxford comma usage. Now I wonder if there is just an Oxford comma test. You’ve stumbled through my ramblings against by brethren, and those that would presume to be my brethren. But not all are bad. In fact, there are, probably, literally thousands of awesome freelance writers out there in the world. Yes, I daringly used ‘literally’ and used it properly. I know, that’s a lot of -ly words and some frown on that, but I did it anyway. Let’s get to the point. How do you know a freelance writer is legit? Easy. Yeah, that’s a pretty good list of ten things. I like the 80/20 rule so if you get a freelancer who pings eight of those things, they’re probably pretty safe. It’s still not a guarantee though. They could be the ‘face’ of a company that employs sub-par writers. So, flat out ask them. If they still seem legit and don’t avoid the question, do a small, one piece project with them. This minimizes your financial investment, and their time investment. If all goes well with that, take the next step, a larger project. I do this a lot with my clients because I know trust has to be earned. By doing a small, inexpensive project, both they and I get to feel out the situation and see if it will be good for both sides. When that works out, then we usually end up on a long-term project together. Got a terrible freelance writer story? Share it in the comments and tell others. Have some other tips on sorting through freelance writers to find a good one? Drop that in comments as well. If the work dries up for those who are no good at it, then perhaps they will stop trying and we won’t have to work so hard to get clients what they need and find a freelance writer who can do the job.